Looking north on CR S-1 (Buckman Springs Road) toward Old Highway 80, Interstate 8 (Exit 51) and the Buckman Springs Rest Area. Photo taken 11/10/12. County Road S-1 winds northward from California 94 near Campo to California 79 north in southeastern San Diego County. The scenic drive links I-81 with Lake Morena, Mount Laguna and portions of Cleveland National Forest along Sunrise Highway. Northbound San Diego County S-1 (Buckman Springs Road) meets at Old Highway 80 at this four-way stop sign. CR S-1 continues along Old Highway 80 west while Buckman Springs Road connects with Interstate 8 and the Buckman Springs Rest Area. Photo taken 11/10/12. This San Diego County S-1 trailblazer at Buckman Springs Road and Old Highway 80 was previously used for County Road 10. Photo taken 11/10/12. Northbound San Diego County S-1 leaves Old Highway 80 (former U.S. 80) east of Pine Valley and crosses over Interstate 8. Photo taken 06/22/04. Beyond I-8, San Diego County S-1 rises into the Laguna Mountains along the Sunrise Highway. Photo taken 06/22/04. Sunrise Highway was built onto a shelf on the side of the mountain overlooking Pine Valley to the west. Photo taken 06/22/04. Sunrise Highway originally skirted around each undulation on the ascent to the Laguna Mountains, but some of these curves were straightened out through cuts such as this one along northbound. Photo taken 06/22/04. Northbound San Diego County S-1 at Milepost 17. Note that most of the plant material is sagebrush and chaparral; more trees become common at higher elevations. Photo taken 06/22/04. Gaining elevation along CR S-1 north, portions of the Laguna Mountains are a part of Cleveland National Forest. Photo taken 06/22/04. The county uses its own variation of elevation sign; here at 5,000 feet. Unlike areas of Cuyamaca Rancho State Park to the west, most of these areas south of Laguna Mountain have not seen wildfires since the 1971 Laguna Fire. Photo taken 06/22/04. San Diego County S-1 passes through the meadow before entering another section of forest. Photo taken 06/22/04. San Diego County S-1 (Sunrise Highway) enters the Laguna Mountain Recreation Area of the Cleveland National Forest. Photo taken 06/22/04. Sunrise Highway is a National Forest Scenic Byway. This trailblazer identifies the route northbound after it enters the recreation area. Photo taken 06/22/04. Tall pine trees accompany sage brush along the immediate county road right of way. Parking is permitted on the side of the road through this area, as a trailhead and information kiosk are located on the east side of Sunrise Highway. A National Forest Adventure Pass is required for parking; a pass may be obtained in Pine Valley or Laguna Mountain. Photo taken 06/22/04. San Diego County S-1 at the Burnt Rancheria Campground on Mount Laguna in Cleveland National Forest. Photo taken 06/22/04. San Diego County uses green mileposts on its county roads, unlike Caltrans and most other local highway departments. Milepost 23 for CR S-1 is located on Mount Laguna. Photo taken 07/24/02. Continuing beyond the community of Laguna Mountain, Sunrise Highway traveled through areas damaged by the October 2003 Cedar Fire. Photo taken 06/22/04. Damage from the 2003 Cedar Fire was profound along Sunrise Highway north between Laguna Mountain and Kwaaymii Road. Photo taken 06/22/04. Northbound San Diego County S-1 approaches California 79 north of Rancho Cuyamaca State Park and Mount Laguna. Photo taken 07/24/02. San Diego County typically signs the ends of its county roads, and the northern terminus of CR S-1 at SR 79 is no exception. Photo taken 07/24/02. California 79 north leads to Julian. California 79 south heads to Rancho Cuyamaca State Park and Lake Cuyamaca. Photo taken 07/24/02. Buckman Springs Road stems west from a diamond interchange (Exit 51) with Interstate 8 to become a part of County Road S-1 south of Old Highway 80. CR S-1 continues eight miles to Lake Morena and 12 miles to Campo. Photo taken 11/10/12. 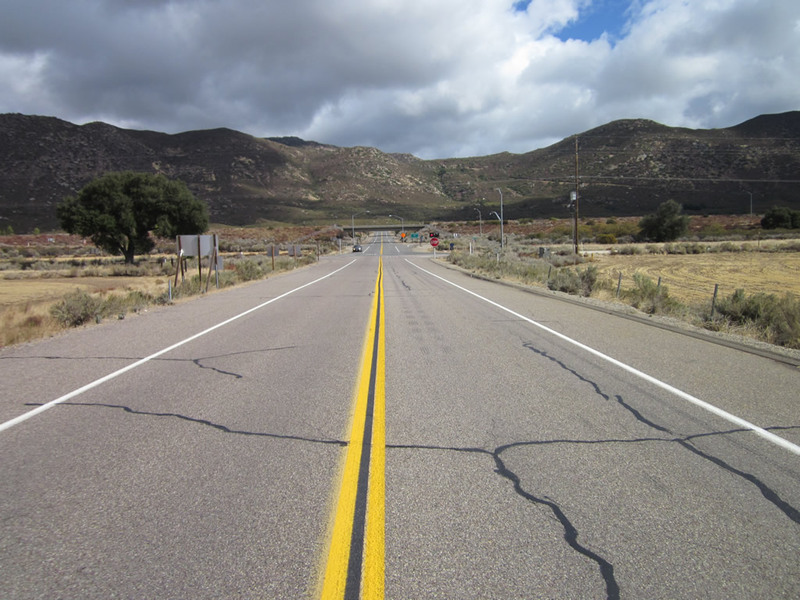 Old Highway 80 continues east from San Diego County S-1 to Boulevard and Jacumba. CR S-1 follows the historic alignment of U.S. 80 west to Pine Valley. Photos taken 11/10/12. Lake Morena County Park and Potrero County Park lie southward along Buckman Springs Road at seven and 19 miles away from Old Highway 80 respectively. Photo taken 11/10/12. The Pacific Southward Railway museum is located in Campo, 12 miles south of of I-8 and Old Highway 80 along CR S-1. Photo taken 11/10/12. The vista of Imperial Valley and the Laguna Mountain Foothills from an overlook along Sunrise Highway near the NORAD weather radar. Photo taken 06/22/04. The brown, stark desert contrasts with the green trees found in the Laguna Mountains. This view is seen from the desert view turnoff from County Route S-1. Photo taken 06/22/04. Looking toward the desert floor from the Kwaaymii Road vista point along Sunrise Highway. Photos taken 06/22/04. For a time, plans called for the Sunrise Highway to skirt along the edge of the cliffs leading down to the desert via Kwaaymii Road. This idea was abandoned due to the narrow right of way and extensive rocks that fell from the cliffs above. This picture shows the northernmost section of the abandoned Sunrise Highway as seen looking south. Photo taken 06/22/04. A retaining wall was considered for supporting the proposed highway, and a portion of it remains in place along an abandoned stretch of road. Photo taken 06/22/04. Portions of the old roadway were used as part of a hiking trail that connects with Sunrise Highway southwest of here. Photo taken 06/22/04.